I joined the team in February 2017 after five long years of working in retail and as a receptionist in a hectic A&E. 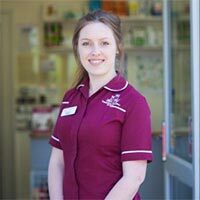 My decision to apply for the job came after my Mum and Aunt reminded me that from the age of three I‘d always wanted to become a vet nurse. Every day I’d pretend I was caring for my teddies in my imaginary vets. Without a second thought I applied for the job here and I haven’t looked back since! I spend most of my time here at the surgery having cuddles with the lovely pets that visit us, as well as booking appointments, creating displays for the waiting room and dealing with client’s enquiries. I‘ve been an animal lover for as long as I can remember and my house has never been pet free, over the years I’ve had numerous hamsters, a budgie, goldfish and even a couple of mice! I‘m currently the proud owner of Smudge the hamster and Loki the mischievous Norwegian Forest cat. I’d love to one day own a Pomeranian!